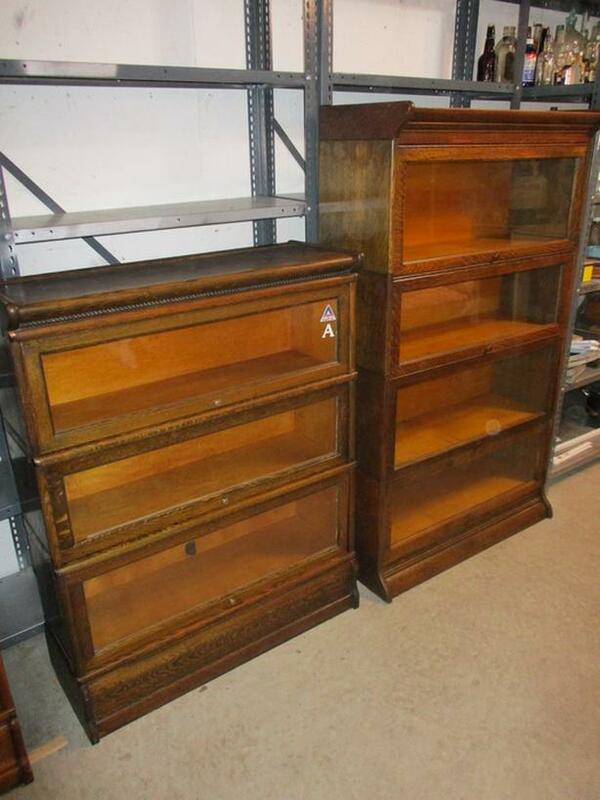 THERE ARE FOUR INDIVIDUAL OAK BOOKCASES FROM A CLEAN HOME. # 1 OUTER MEASUREMENTS ARE 34 INCHES WIDE, 12 1/2 INCHES DEEP AND 49 INCHES HIGH. IT IS MADE UP OF THE CROWN, THREE INDIVIDUAL DRAWERS AND THE BASE. THE INTERIOR MEASUREMENTS OF THE DRAWERS ARE 32 INCHES WIDE, 10 INCHES DEEP AND 9 1/2 INCHES HIGH. PART OF THE OAK STRUCTURE IS 1/4 CUT OAK. IT HAS THE ORIGINAL GLASS. IT SITS FLAT TO THE FLOOR. IT IS CLEAN, SOLID AND READY TO USE. # 2 OUTER DIMENSIONS ARE: 34 INCHES WIDE, 12 1/2 INCHES DEEP AND 51 INCHES HIGH. THIS GOLDEN OAK BOOKCASE HAS A CROWN, THREE SHELVES AND THE BASE. THE INTERIOR DIMENSIONS OF THE DRAWERS ARE: 31 1/2 INCHES WIDE, 9 1/2 INCHES DEEP AND 11 1/2 INCHES HIGH. IT HAS THE ORIGINAL GLASS AND PULLS. IT IS PARTLY MADE OF 1/4 CUT GOLDEN OAK. IT WAS MADE BY THE GLOBE WERNIEKE CO. LTD. OF STRATFORD, ONTARIO. IT IS CLEAN, SOLID AND READY TO USE IMMEDIATELY. # 3 OUTER DIMENSIONS ARE: 34 INCHES WIDE, 12 1/2 INCHES DEEP AND 34 INCHES HIGH. IT IS MADE UP OF THE CROWN, THREE SHELVES, AND THE BASE. MOST OF IT IS MADE OF 1/4 CUT OAK. THE INTERIOR DIMENSIONS OF THE SHELVES ARE: 32 INCHES WIDE, 10 INCHES DEEP AND 8 INCHES HIGH. IT IS CLEAN, STURDY AND READY TO USE. # 4 OUTER DIMENSIONS ARE: 34 INCHES WIDE, 14 INCHES DEEP, AND 58 INCHES HIGH. IT IS MOSTLY MADE FROM 1/4 CUT OAK. IT IS MADE UP OF THE CROWN, FOUR SHELVES AND THE BASE. THE INTERIOR MEASUREMENTS OF THE SHELVES ARE: 31 1/2 INCHES WIDE, 10 1/4 INCHES DEEP AND 10 3/4 INCHES HIGH. IT IS CLEAN, SOLID AND READY FOR ANOTHER 100 YEARS.